The first goal is to teach handlers how to train the direction and control exercise. The second goal is to help the handler take a very basic tool and make it an advanced skill. A skill which enables the handler to direct the dog to an area without any visual cues (like pallets) and then direct the dog in a different direction. This is the same exercise used in the FEMA National Search Canine Readiness Evaluation. Critics of the direction and control exercise are many. They refer to it as playing circus games. A lot of time spent on foolishness, as there are no pallets or targets on the rubble pile. To these critics I say, "You are absolutely right". However, if they were truly thinking, they would see that the Direction and Control exercise is only the beginning of the training. It is the tip of the iceberg. The handler can communicate with the dog by giving directions and hand signals and the dog will respond and generalize based on the foundation training the dog has received. Once the dog has been trained to the pattern, the real training begins. Now you must systematically decrease the size of the target and the height of the target and eventually eliminate the target. !! The goal of the exercise is to direct the dog to an area without any visual cue. This behavior is trained as a reverse chain, starting with the most difficult exercise in the chain for most dogs, the "go back" to the second base pallet. 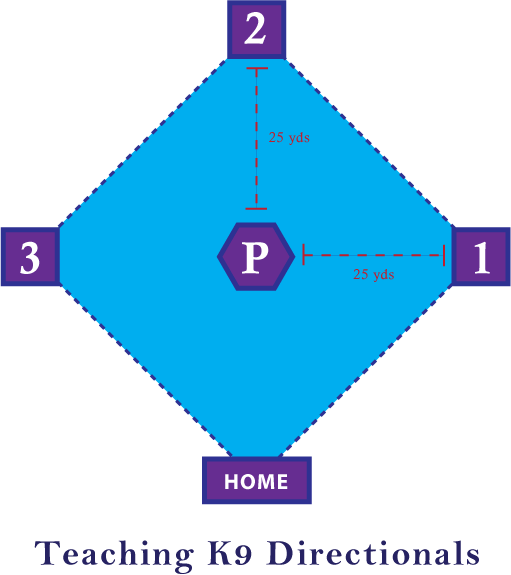 To clearly define what pallet/platform I'm talking about I will use the Baseball terms of Home Base (an 8-ft. line), first base, pitcher's mound, second base, third base. There is a diagram sketch at the end of this paper. Have it handy as you read the directions. It will help clarify the explanations. There are some very good books and videos by Karen Pryor, Gary Wilkes, and others that teach the clicker method of training set by step. I recommend using clicker training for this exercise. If you do not want to use a clicker you can substitute a "marker" "Yes" or "Good" that makes the exact behavior you are rewarding. To begin this training the dog must have some basic knowledge of the command to "HUP" (get up on something), to stay, to "SIT" or "DOWN" and come when called. These commands are cues used in the initial training of the exercise. Like all cues they will be eventually phased out. The reward (reinforcer) is a matter of choice. The handler can use food or toy. I recommend using food for several reasons. One, as soon as the dog swallows it is gone and I can re-focus the dog on the training task. Two, I do not have to take the toy from the dog and put it away, which takes time and breaks the training focus. Three, it leaves the toy and a good game as the high-light at the end session. I do not like to use food on the base or target. If food is used on the target it should be on a plastic lid so the platform or target will not become food saturated. This causes dogs to (stop,) sniff and look for left over food. There may be times when putting food on the target is helpful. In my opinion, using the food as reward for doing the behavior is a far better way of training. So, run out to the dog and give the treat rather than putting the food on the pallet for the dog to find. Initially, the food will be used on a fixed schedule, every exercise is rewarded, but the goal will be to put the reward/reinforcer on a variable reward schedule. The dog will never know when it will be rewarded. If toys are used as the reward, the play should be kept at a minimum and the reward schedule should be the same as for food. The training field can be your back yard if it is big enough to accommodate two pallets 25-yards apart. However, the handler will need to set the complete course up eventually. Many resourceful handlers build or have made a set of nesting targets that they can transport to different training areas. For the purpose of training the targets/pallets do not need to be regulation size. The ability to have a full course set up that can be used every day is ideal. It is better to train in two short sessions per day, but if you can only manage one, make the best of it. Do not try to produce perfection in one or two training sessions. Before we actually start training, we need to discuss your training attitude. It is very important that you remain upbeat, make the game fun, and do not get into a power struggle. You are the director. Make your directions clear. Do not allow the dog to make mistakes. If the dog makes a mistake, then you have failed in making the direction clear, because you are in charge. It is far better use of time to not allow mistakes to happen than to spend time trying to correct or modify an unwanted behavior. Oh, I forgot to mention that you will be expending more energy than the dog for the first few weeks. Be sure to wear comfortable shoes. "WAIT" - at pitchers mound, and then recall Home. Whatever commands you chose to use, they must not conflict with any other command that you have used in training the dog. Hand signals are the next important issue. They must be given so the dog can see exactly where you are directing them. One important point to think about is the mechanics of the hand signal. The arm should be fully extended away from the body and the hand open with the palm toward the dog. When you are giving diagonal direction, make sure that your body does not conceal the hand signal. The handler should face the target base the dog is on when giving hand signals. There are many variations of hand signals with many different interpretations. The choice is yours, but it is very important to be consistent and clear. There are many Obedience Books that teach hand signals. Whatever hand signals you chose to use they must not conflict with any other hand signals that you have used in training the dog. Do not expect complete transference of AKC "GO OUT" or the Schutzhund "GO OUT" skills. Yes, you will have a foundation to build on and as such should progress through the program more quickly. The hardest part is the training the first leg from Second base to Pitcher’s Mound. Every exercise will begin with a voice command and a hand signal. Usually in clicker training we teach the behavior, and then name it. This is good advise, but in training this behavior, we have modified the procedure. It is important to begin each exercise with both cues. With the dog on a 25-foot lead, we begin at the Second base target. The dog should know the "HUP" or "GET UP" command means to get up on an object. With the dog on lead, heel up to the target and give the HUP and SIT commands. The dog should get up on the target and immediately SIT or DOWN. This is the baseline behavior. The dog must do this on command before continuing with the lessons. A dog that has had clicker training ( CT = Click & Treat) moves through the program very quickly. Targets (4) - approximately 36" x 24" x 10" to 20" high. All targets placed 25-yards from center target. For this first drill, you will only need 2 targets, and not the entire diamond of targets. The second target is only used in Step Six. Repeat this sequence on all four sides of the target. Dog sits and faces handler who is facing second base. The goal is to increase by 5-yards each set. This may be to much for some dogs or some dogs may do several sets per training exercise. Add center target at 25-yds. Start Dog sitting on center target. This completes the training of the first leg. It is time for the dog to have some fun. I like to end this exercise with a bark alert. If you can do it in a place where you have a bark tube it makes a powerful ending for most dogs. In teaching the " OVER", the handler must stand facing the dog. The dog is on-course from Pitcher's to First base. The handler stands 3-5 yards away from the dog. Teach the Right target first, and then the Left. Handler stands facing the dog. Dog on short grab lead. RECALL command and hand signal to center target. HUP, SIT on center target, CT Reward. Heel dog off target – lots of verbal praise and play. The lessons for Leg #2 and #4 are the same. Reverse the directions to go the Left side. Legs #3 and #5 are the same directions to Base Line. Once the dog has learned both diagonal directions; Right & Left Targets, then the dog may be sent on rare occasions from Base Line to the Center Target. This gives the handler the option of sending the dog in three different directions. diagonally to the Right, straight to the Center Target, and diagonally to the Left. !! Remember, the center target is the target that is the closest to the dog and the most visual to the dog. Use it on rare occasions and never until the dog has mastered the whole course well. Now that the dog has learned this pattern, it is time to take the training on the road. It is important to practice these exercises in many different training areas using many different target materials. The dog should perform this exercise with all kinds of distractions. It is very important that the dog learn to take the direction with no visible target. Carpet squares (samples) are an excellent tool to use. They lay flat and the dog can not see them until he is very close. Some handlers even cut the squares in half, then in fourths and so on until there is no target for the dog to see, but must rely on the handler's direction. Training on the rubble is part of the finished product. Take the dog to the rubble and practice moving the dog around to different locations. Give the dog lots of praise and then set up a very rewarding run-away or pop-up in the rubble for the dog to finish the training exercise. Keep direction and control fun for you and the dog. After retiring from nursing in 1990, Shirley Hammond dedicated her time to K9 search & rescue. Along with being a Handler/Member of California Task Force 3 (FEMA), she is an instructor for FEMA's Urban Search and Rescue (USAR) Task Force Search certification. She is the author of "Training the Disaster Search Dog". In the past 20+ years, Shirley Hamomond has trained dogs in area search, disaster, cadaver, evidence and water search.